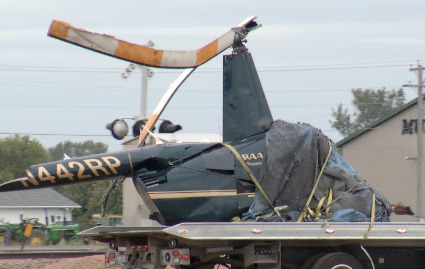 On October 5, 2015, about 0910 mountain daylight time, a Robinson R44 helicopter, N442RP, impacted a building during takeoff from a private landing area near Parkston, South Dakota. The commercial-rated pilot and one passenger received serious injuries. The two additional passengers were not injured, and the helicopter sustained substantial damage. The helicopter was registered to Woodley Aerial Leasing LLC and operated by Woodley Aerial Spraying Inc., under the provisions of Title 14 Code of Federal Regulations Part 91 as a personal flight. Visual meteorological conditions prevailed at the time of the accident and an instrument flight plan was not filed. The pilot stated that when he landed he left some distance between the helicopter and the adjacent building, with the tailboom pointed away from the building. The load truck with trailer was then parked between the helicopter and the building. He expected to "shut down the helicopter so the spray system could be installed." However, before he helicopter was shutdown, the owner asked the pilot to give 3 passengers a ride. The passengers boarded the helicopter and the pilot proceeded to depart. The pilot reported that as soon as the helicopter lifted, a tailwind gust pushed the helicopter forward. He added that it happened so fast, he did not have time to recover and the helicopter impacted the load trailer and side of the adjacent building. The closest weather reporting station located at the Mitchell Municipal Airport, South Dakota, about 24 miles north of the accident site, recorded wind from 170 degrees at 7 kts. The pilot reported there were no mechanical anomalies that would have precluded normal operation of the helicopter.